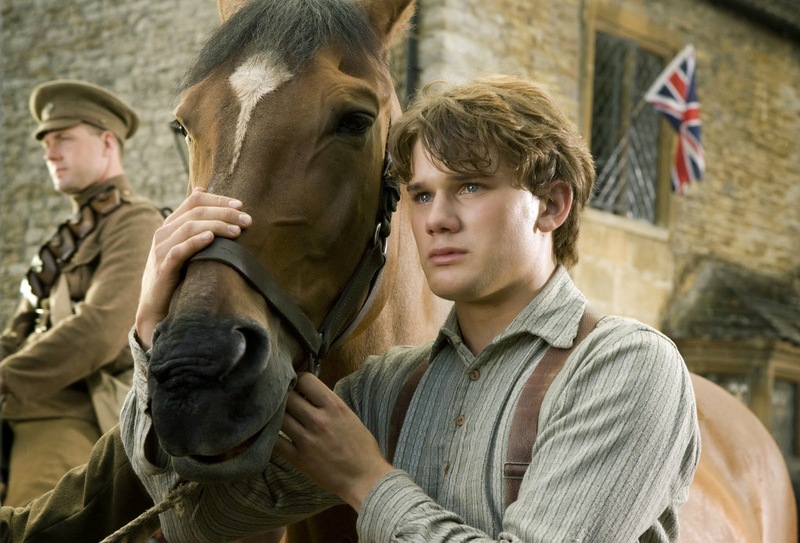 When War Horse came out in 2011, it had been six years since Munich, Spielberg’s last dramatic success. Before that, you have to go back to 1998 and Saving Private Ryan to find a film that screams Spielberg, that was a hit with both audiences & critics. Go a little further back and you’ll come across a whole list of classics: Amistad, Schindler’s List, Jurassic Park, Hook, Always, Indiana Jones, E.T., Close Encounters, Jaws. My point is, Steve’s been a little off his game. He’s probably the most famous director in Hollywood, an extremely wealthy & successful man, a genius & a pioneer. But he’s had some down years and I was ready for War Horse to be somewhat of a breakout. The horse in question is named Joey. He’s a spirited young stallion from Devon, England who is sold to a local farmer for much more than he can afford. Untrained and undisciplined, the horse proves a trial, until the farmer’s son, Albert, takes charge. Joey & Albert become best friends, proving time & again that they can overcome any obstacle together. But when war is declared between England and Germany, everything changes. Joey is sold to the cavalry against Albert’s wishes, although the latter swears that someday they will be together again. The young equine recruit crosses with the British invasion into Germany where be embarks upon an epic adventure that spans the length of the war. At different times he is an officer’s mount, a clearer of battlefields, a puller of artillery, a young man’s ticket to freedom, a young girl’s dream come true, and always a soldier. He travels Europe as an unwilling part of WWI, a witness to the hell that is war. I’m a little torn, reviewing this movie. First off, I didn’t feel much Spielberg. It felt more amateur that his usual style, a bit cheesy when I wanted heart instead. I was surprised by such over-work in a film directed by such a talent, such dramatic messages that could have been delivered more simply. The whole film felt sappy and designed for a younger crowd, a way to talk about the horrors of war without actually having to show anything horrible. It was a far cry from Saving Private Ryan, and I’d think Spielberg would be embarrassed with this film when he compares it to that. But I’m not completely cold-hearted, I was rooting for the horse & his boy, I was invested a bit. Although, my interest was more focused on the war through the horse’s eyes. He was a smart vehicle for the plot, a clever way to show all sides & times yet still stay with one character. That character was an animal, but it still worked, it still showed me what WWI was like on the inside, behind different trenches, and I enjoyed that view point. Can you like a movie even though you didn’t like the movie? That’s how I feel about War Horse; it was an over-dramatic war movie that had a great concept, a film that disappointed & entertained in turns.